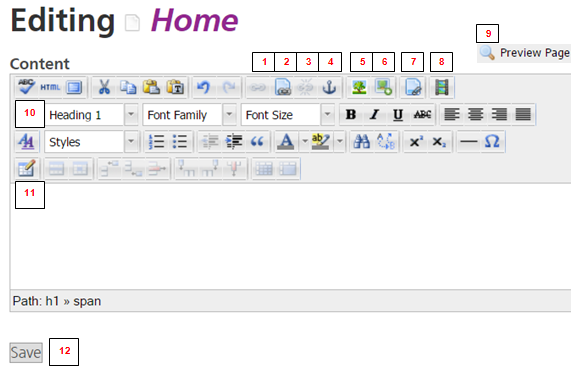 Clicking on the Edit Content tab shows you the screen below (where Home is the name of the page you are editing). Many of the icons in the editing option icons are standard icons that you would get in a word processing package such as MS Word eg cut, paste, undo, make bold etc. You can hover over the icons and they will display their function. We will focus on some key ones as per the numbered list below. 1. Insert/Edit Link To insert or edit a link to a page on a different website or to insert a link to an email address. 2. Insert link to a page To insert a link to a page on your website. Click on the link to find out more. 3. Unlink To remove a link that you have added. 4. Insert/Edit Anchor To insert or edit an anchor. Click on the link to find out more. 5. Insert/Edit Image To insert or edit an image. Before you can insert an image (eg a jpg), you need to upload it from your PC. NB If you upload a revised version of an image which has the same name as the previous version, if the old version continues to be displayed, press F5. If the old version continues to be displayed, you will need to upload the revsied version using a different name. Before you can insert a file (eg a pdf), you need to upload it from your PC. NB If you upload a revised version of an image which has the same name as the previous version, if the old version continues to be displayed, press F5. If the old version continues to be displayed, you will need to upload the revised version using a different name. 8. Insert/Edit Embedded Media For inserting embedded media. 9. Preview Page To preview the page as it looks in a browser. NB Don't forget to Save (see below) before you click on it. 10. Format When you start typing your text, the format will automatically default to Paragraph format which is the one you will be using most of the time. There are also six Heading formats set up. You can override the formats by changing the font size etc. 11. Insert/Edit Table To insert a table. This works much the same way as a normal table but is a bit fiddly. This section you are reading is in a table as tabs are difficult. 12. Save Don't forget to Save. We recommend you get in the habit of saving on a regular basis what you are editing so that you don't accidentally lose it! Tip: When you press return in the editor, it automatically leaves a line space. If you don't want that line space, use SHIFT+RETURN (but note that this will not work if you have selected one of the Heading formats).